Don’t just think of wine when you think of Bordeaux! Known as City of Art and History, this ancient city has much more to offer, from its ample historic buildings to its monuments and gardens, you can visit Bordeaux for a wine tour and tasting, and stay for a night at the opera, then enjoy its restaurants or its great shopping opportunities. Discover all these attractions and more in our top 10 things to do in Bordeaux. 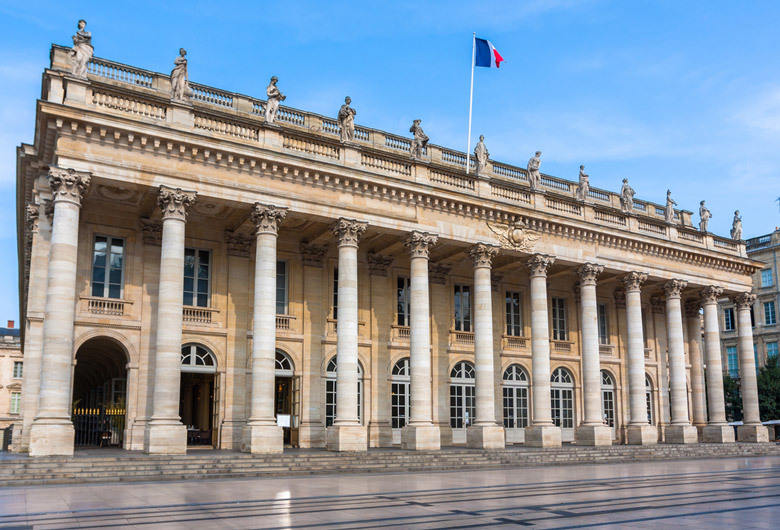 Bordeaux is best known for its architecture and monuments but it also has some great museums including the Fine Arts Museum and the first entry on our list of things to do in Bordeaux, Musee d’Aquitaine. 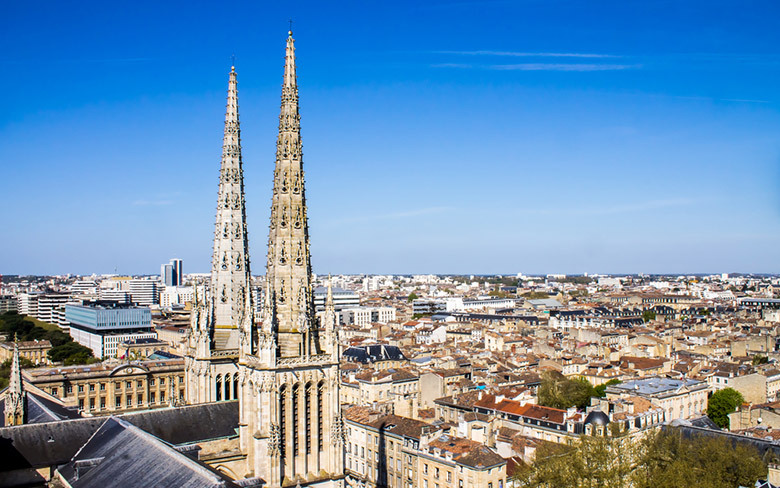 This one has made it onto our list because it focuses on the history and archaeology of Bordeaux and the surrounding Aquitaine region, making this a great Bordeaux attraction for anyone interested in the city’s history. As you start browsing the exhibits you’ll begin in prehistoric times and move forward through history on a timeline that takes you right up to the 20th century with some of the highlights being Roman times and the re-creation of the Lacaux Caves which is always a favorite for children visiting the museum. Although the exhibits are good, many of them only have French language signs to explain what it is you’re seeing so this can be disappointing to anyone who doesn’t speak or read French. Even so, the visual aids are usually good enough to give you a good idea of the events and the objects you’re seeing. Entry prices are very reasonable and the museum is a popular Bordeaux attraction especially on rainy days. Many people say that Rue Sainte-Catherine is the longest pedestrian street in Europe. 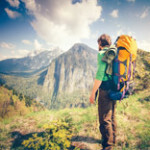 Whether that’s true or not, this top thing to do in Bordeaux will have you shopping until you drop with so many great stores to check out along its 1.2 kilometer (0.75 mile) length. Rue Sainte-Catherine is Bordeaux’s answer to London’s Oxford Street. It is the main shopping street of the city and stands on the edge of the city’s main commercial area, and it’s the place to be seen if you’re a young and trendy Bordeaux local! As for tourists, you’ll find this street packed full of visitors too, especially on a Saturday when it seems everyone in the city is shopping here. While this isn’t necessarily a good place to come for a bargain, it’s great for variety, especially clothes, and when your feet need to rest or you simply want to people watch, sit and grab a coffee and pastry in one of the many cafés that line Rue Sainte-Catherine. For something a little different you could also head into Galerie Bordelaise which is a historic shopping mall set at one end of the street that opened in 1834. Located on the outskirts of Blanquefort, a commune within the Bordeaux Metropolitan Area, Parc de Majolan is a welcome addition to our list of the top things to do in Bordeaux as it offers something a little different. A great place to come with children when you want to escape the busy heart of Bordeaux, Parc de Majolan features a lake and waterways as well as a fun grotto to explore. Created between 1870 and 1880 for a wealthy banker, the park is said to have been created to make his sick step daughter feel better. It was owned privately for many years until the town bought it in 1975 and it was finally opened to the public in 1984. From a former swamp, the park has become a popular walking area for residents of Bordeaux and Blanquefort and is also popular with tourists looking for an escape from the city for an afternoon. 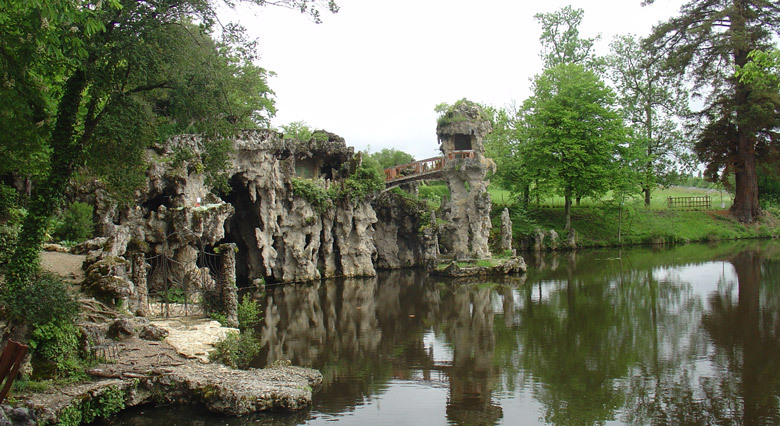 The man-made grotto and caves are lots of fun for exploring, especially with children, and there’s a lake with plenty of birdlife and wildlife to look out for including the cute coypu, a type of river rat, who are fond of fruit if you’d like to feed them. It’s amazing to think that this was the very first bridge to cross the River Garonne in Bordeaux and that it was not until 1965 that another bridge was added as an alternate way of crossing the river. 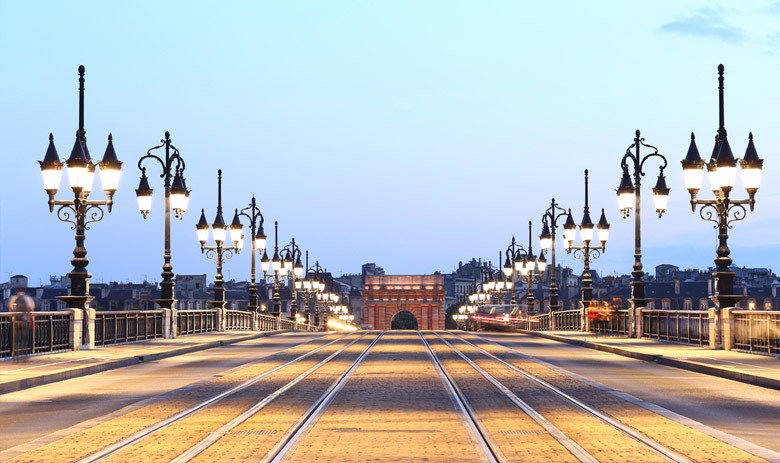 What makes Pont de Pierre so special as a thing to do in Bordeaux is its history and attractive design. Construction of the bridge was ordered by Napoleon Bonaparte during the First French Empire (1804 – 1814) but it wasn’t actually built until between 1819 and 1822, and because of the strong river currents, building the bridge was very challenging. You can walk, drive, bicycle or take a tram across Pont de Pierre, or you can even take a boat cruise and travel underneath it. The bridge looks its best from the banks, a little distance back from the bridge so that you get the best views. You’ll see the seventeen arches that represent the seventeen letters in Napoleon Bonaparte’s name, and also the city’s coat of arms. If you enjoy photography, try to come back at different times of the day and during different weather for some great photos. Today there are several other bridges crossing the Garonne, though Pont de Pierre is by far the nicest. 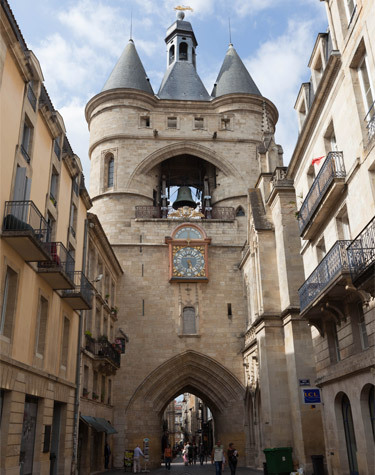 Although this city gate, its towers and its bell are very large you probably won’t see them until you’re right on top of them thanks to the many buildings around it and the warren of streets that make up the heart of old Bordeaux. Meaning “Great Bell”, Bordeaux’s Grosse Cloche is in the belfry of the former town hall and was built in the 15th century on the site of the remains of a 13th century city gate, named Porte Saint-Eloy. The attractive Gothic architecture includes two towers that are connected by a central building, and in between the two towers is the Great Bell. Grosse Cloche is today a popular Bordeaux attraction but it was very important hundreds of years ago as the bell was used to alert residents if there was a fire in the city or at harvest time. Because of its importance the bell is on the city’s coat of arms and although it’s not the original bell this one does date from 1775. If you’re visiting Bordeaux during the summer be sure to allow time to go inside the tower when it is usually open from 1pm to 6pm. The Grand Theatre of Bordeaux certainly lives up to its name; it is grand through and through! 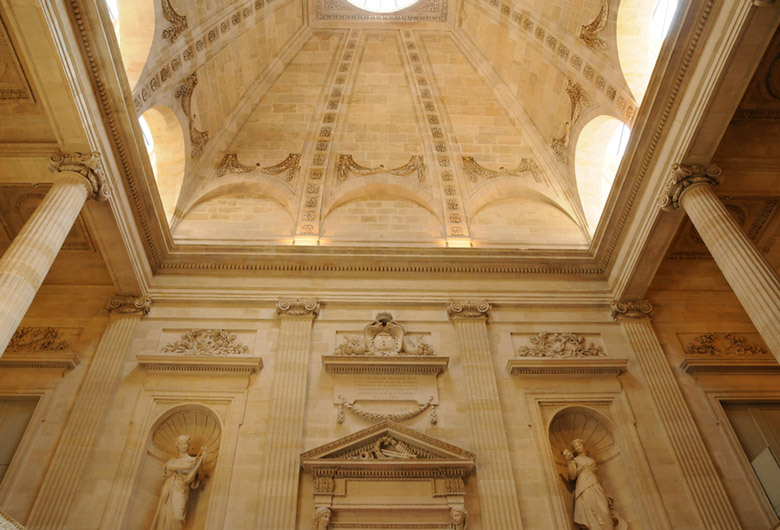 Designed by architect Victor Louis, this Bordeaux attraction was inaugurated on 17 April, 1780. On the outside the building has a typical neo-classical façade to match the theatre’s intended concept as a temple of the arts. Look above the twelve columns on the façade and you’ll see twelve statues representing the nine Muses and three goddesses. Inside the grandeur continues – the interior of the Grand Theatre was restored in 1991 to its original colors of blue and gold and it features beautiful murals and detailing that will have any visitor thinking they’ve stepped back in time to the 18th century. 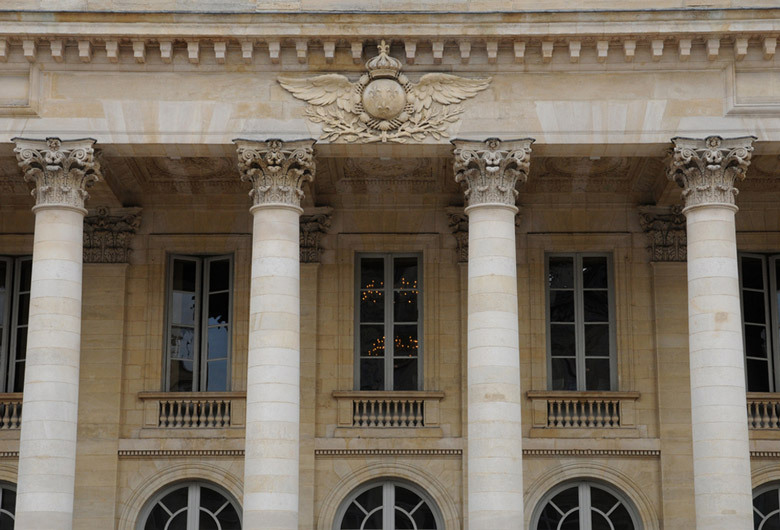 Today the Opera National de Bordeaux and the Ballet National de Bordeaux call the theatre home. Try to visit and get tickets for a performance here to be able to fully appreciate the experience and the architecture. There are not only opera and ballet performances but a wide variety of events held at different times of the year. 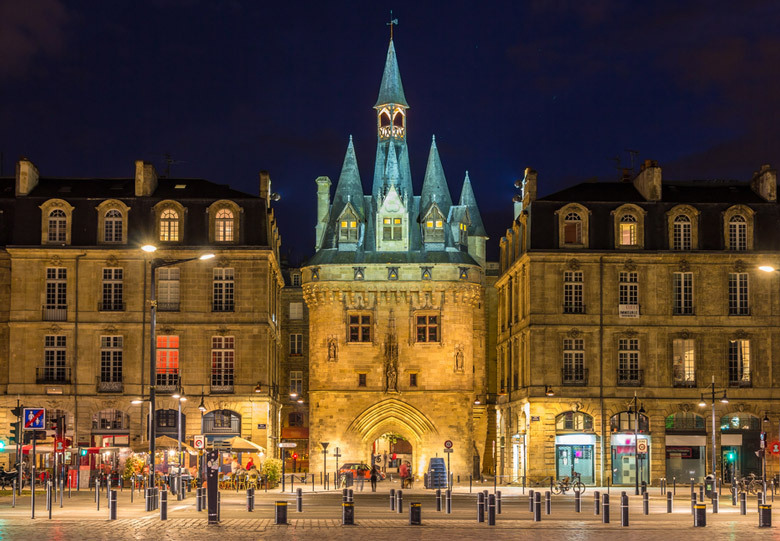 Another beautiful and striking piece of architecture on our list of the top things to do in Bordeaux, Porte Cailhau has an almost fairytale quality. Also known as Palace Gate, this gate to the city of Bordeaux was built between 1493 and 1496 and sits on the site of an even earlier gate that was set into the city walls in the 14th century. Sitting at the entrance to Palace Square, Porte Cailhau was the main entrance into the city from the port. Back then access to and from the boats was quite different as there were no piers. The boats anchored in the river and the river bank gently sloped down towards them. From a tourist’s point of view Porte Cailhau is a pretty monument. The architecture is somewhere between Gothic and Renaissance and it closely resembles what we’d think of today as a fairytale castle with its turrets, portcullis and dais. You can enter inside this Bordeaux attraction, going up the first couple of levels for free or there’s a small fee to pay if you’d like to go up to the upper level and enjoy the great view of the water. 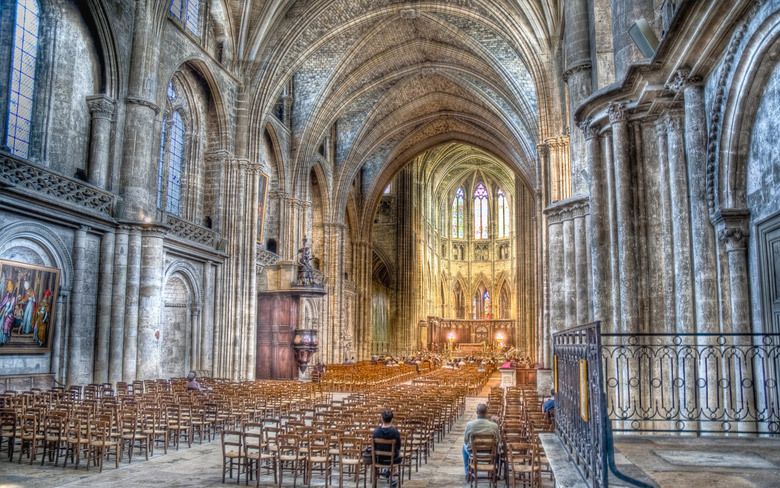 Officially named Cathedral Saint-Andre de Bordeaux, Bordeaux Cathedral is a national monument of France. 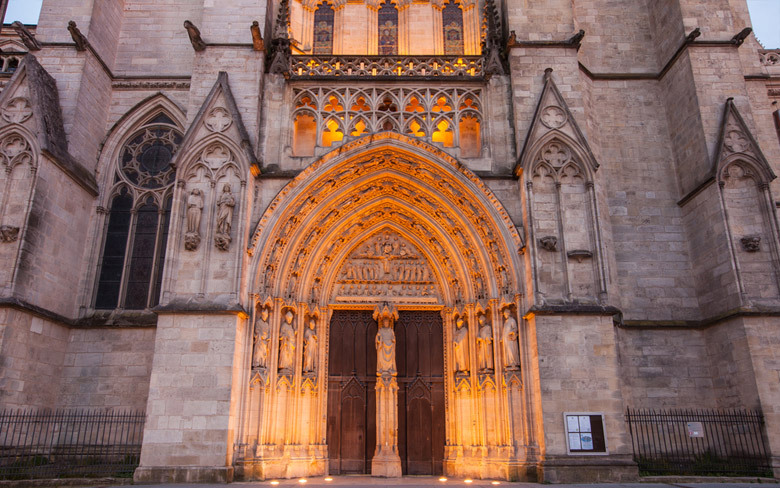 While the city has many churches, its cathedral should be on your list of what to do in Bordeaux because of its size, history and beauty. Mainly classified as being of Gothic architecture, the church has remnants from its original Romanesque construction, and the Royal Gate from the 13th century, while most of what you’ll see here today was built in the 14th and 15th centuries. Inside, the cathedral features soaring ceilings, beautiful stained glass windows and plenty of statuary. Bordeaux Cathedral is situated on a large square named Place Pey Berland and as well as the cathedral it features a separate bell tower. Tour Pey-Berland was named for its patron, Blessed Pay Berland who was Archbishop of Bordeaux in the 1400s. The tower was built between 1440 and 1500 but didn’t serve as a bell tower until 1851 when bells were finally installed. Today visiting the tower for the amazing views is a popular thing to do in Bordeaux. There are around 230 narrow steps to traverse to get to the top of the tower, but the views are well worth the climb! 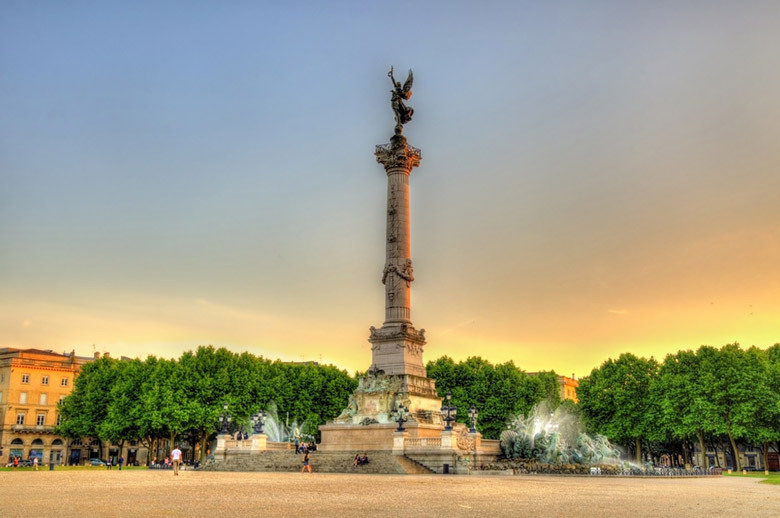 Of all the monuments in Bordeaux this one, Monument aux Girondins, is probably the most recognizable and easy to find. Set back at one end of Place des Quinconces and just across the street from the Garonne River, this majestic monument was built between 1894 and 1902 in memory of the Girondins. The Girondins was a political group during the French Revolution who were executed en mass at the beginning of the Reign of Terror. Monument aux Girondins is the main monument on Place des Quinconces, which, by the way, is one of the largest city squares in Europe at approximately 31 acres. From a distance it’s the central column that dominates this Bordeaux attraction, standing 54 meters high and topped with a bronze statue of Liberty breaking its chains. At the bottom of the column are two pools decorated with impressive horses and other sculptures, and when the fountains are turned on it becomes even more powerful, as though the horses are breaking out from the water and escaping to freedom. The square in front of the monument is often used for large public events and concerts as well as regular markets which are fun to browse after visiting the monument. Although strictly speaking Place de la Bourse and the Miroir d’eau are two separate attractions, we’ve grouped them as one because they’re located right next to each other. 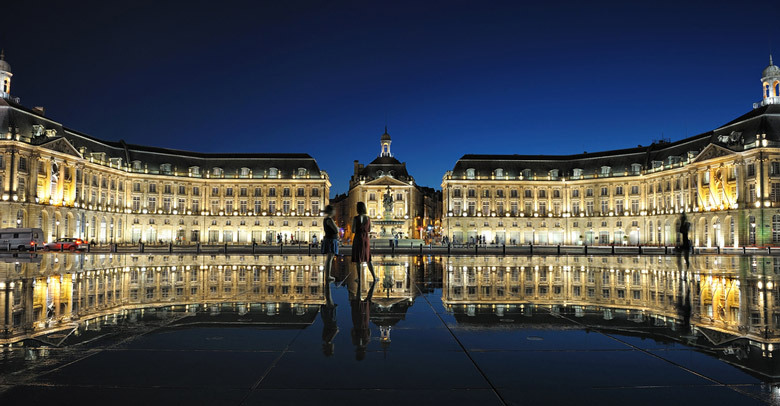 Also known as Place Royale, Place de la Bourse is one of Bordeaux’s most famous landmarks. In a city filled with impressive buildings, this royal square is the epitome of 18th century architecture and is made all the more special by its location right by the River Garonne. The square and its surrounding buildings were built between 1730 and 1775 and were designed by Ange-Jacques Gabriel. Just across the street, and oriented perfectly with Place de la Bourse, is the world’s largest reflecting pool, the Miroir d’eau. Combined with Place de la Bourse this is the top thing to do in Bordeaux, particularly in the summer when the reflecting pool is filled with happy kids, splashing around to keep cool. If you enjoy taking amazing photos, this should definitely be on your list of what to do in Bordeaux. The reflecting pool provides an beautiful mirror image of Place de la Bourse and is most spectacular at night, without the splashing kids, when it can also reflect the lights from the buildings.